If you love old school G-bodies you will be more than impressed by this 1980 Chevy Malibu Wagon that showed up at the Holley LS Fest. The appearance is certainly not of a grocery getter/sleeper, so you can figure it has some power to back it up. It sports a 5.3 LS motor equipped with a pair of 76mm turbochargers producing a little over 600 horsepower allowing this Chevy Malibu Wagon to score 10-seconds on the quarter mile. 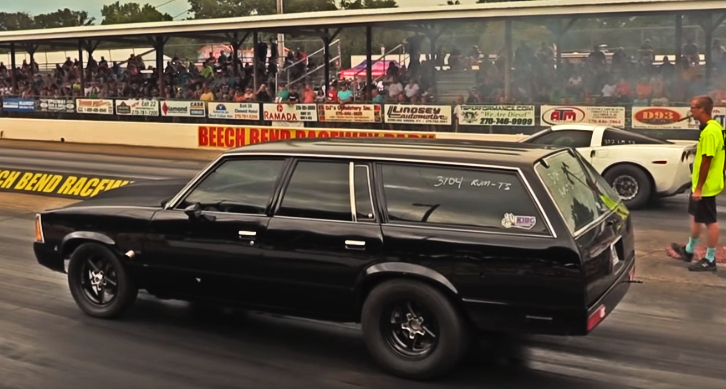 Check out the BigKleib34 video to see GrandMa’s LS Wagon drag racing and make sure you smacked the Like button below!